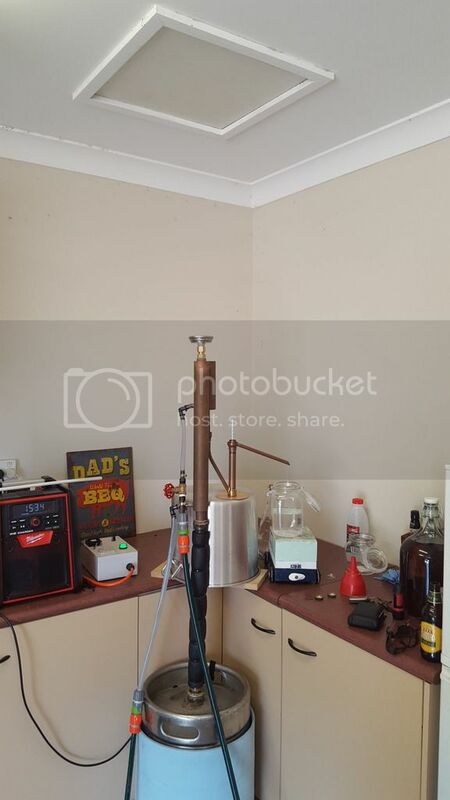 Aussiedistiller, Home Distilling, Moonshine, Home Brew • View topic - Marrying a boiler to a still. Marrying a boiler to a still. Re: Marrying a boiler to a still. equipment: Stainless 50L boiler, 2200w element, 1M Copper Reflux Still, Punchys power controller, Water pressure reg. That's a hell of a setup. I do have a third keg that is my current boiler. Would you run wash or back set in the thumper. Combo of both? 1. Would it be worthwhile leaving my 2200w element in the keg that will be the thumper to speed up heat times. 2. 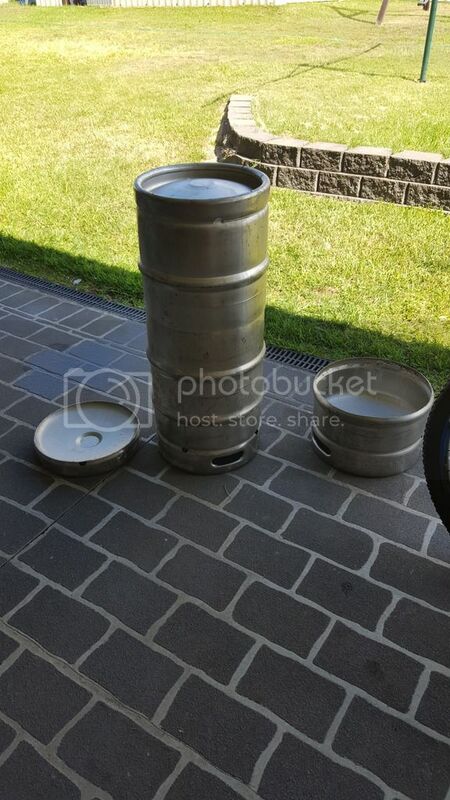 Is there any advantage in cutting the standard neck of the keg and using a 4inch connection for the bubbler or just use an adaptor up to 4 inch. Was originally thinking 4 inch on both kegs, with the main boiler using a 4 to 2 reducer for the line running into the thumper. then 4 inch on the thumper for the bubbler to connect to. Thanks man. Might move the element so I can use it as a single boiler If I wish and fit a temp gauge where it was. Flipping the keg is definitely the go. Ok, bit of time off so have started. Total capacity is 83L with a height of 890mm. My still is currently positioned under the man hole. Can anyone tell me the height of the FSD Eliminator. Obviously Mac can, but its xmas eve & I don't reckon he will be at work atm. This will be going onto a 25 x 25mm angle framed trolley with existing 50L still as a thump. 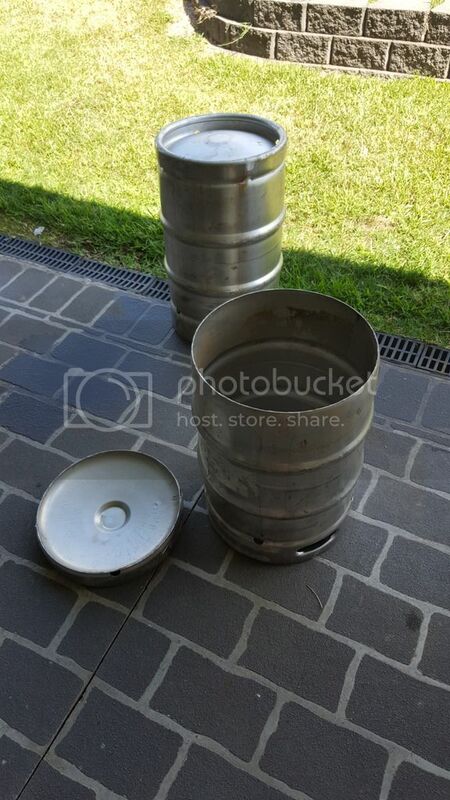 Nah, 1.75 kegs high. Just welded it together and did a capacity check. Came in at 80l to the top, so 70l realistic usable level. Pretty happy really. Just need to get my thump keg sorted.